Company: Tiger barbs should be kept in-groups of at least six to ease aggression. When kept in small numbers tiger barbs will stress and nip other tank inhabitants. Aquarium setup: Puntius tetrazona can be kept in most setups but the aquarium need to have good circulation. Should be kept in large groups. Prefers aquariums whit heavily planted sides and a lot of open water to swim in. Feeding: Tiger barbs are hardy eaters who will accept a wide range of food. A varied diet of flaked, frozen and live foods is a good choice. Vegetables such as peas and cucumber should be used occasionally to keep them in good condition. Care should be taken not to over feed them. An easy way to spot over feeding is their head pointed down motion. 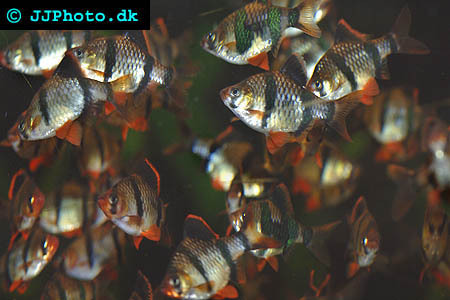 Breeding: Puntius tetrazona (Tiger barb) Males have deep orange-red fins and a bright red snout. The females are easily spotted by their comparative lack of colour and their deep, convex body shape. They are egg scatterers and will drop between 50-100 eggs which will then fall between the substrate preventing the parents from eating them. Although they aren't very fussy about water spawning conditions, they do prefer softer water and low alkaline conditions. The parents should be removed from the tank once eggs are spotted. Incubation will last about 48 hours before fry start to hatch. Microworm and brine shrimp should be fed as well as finely crushed flake food.